Front row, left to right: Theodore, child Tady, Chester, Roy, Doris, Esther, Rita, Effie. Middle row: Carl. 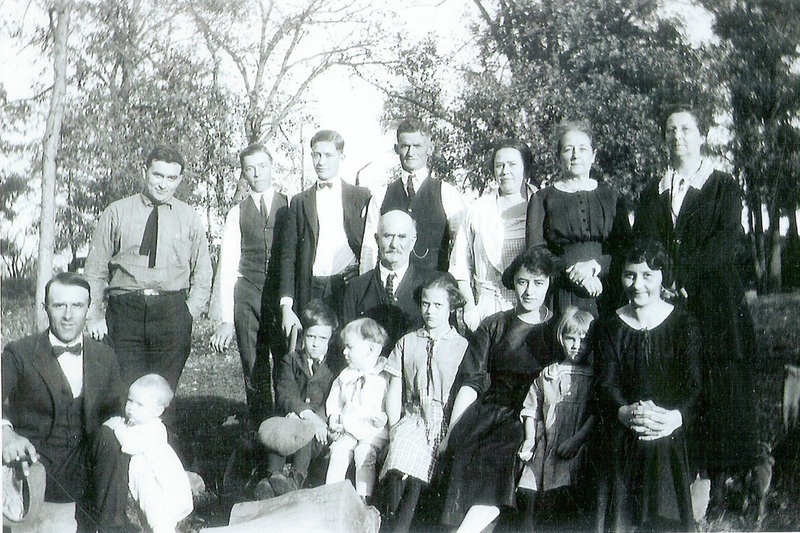 Back row, left to right: Carl Jr., Vincent, Peter, William, Helma, Hulda, (Mayme?). $10 per person-those under 12 free. Maximum family cost is $30. At 5 pm join us for an informal gathering of relatives and friends of the Peter Spinner Family! Registration $25 per adult, $10 per student over 12 and those under 12 are free. Maximum family cost is $60. 8:30 am: Join us for a hike to Mount Hosmer (purely voluntary). 9 am: Registration and tour sign-up will begin at 9am at TJ Hunters on Main Street. 9:30 am: Sharing of memorabilia, pictures, letters, artifacts will be available at TJ Hunters. Update your family records. 10:00 am: Tour of Village Creek and the Peter Spinner Farm will leave from TJ Hunters. 11:00 pm: Learn more about your relatives from Waterville, the C.A. Spinner Family. Tour Waterville and the beautiful Cherry Mound Cemetery. Tour leaves from TJ Hunters and Village Creek. Box Lunch available for $9.00, call 952 546-3199 to reserve yours. 1:30 pm: Sharing of memorabilia, pictures, letters and artifacts. Update your family records. TJ Hunters. 2:30 pm: Gethsemane Cemetery Tour leaves TJ Hunters. 4:00 Program begins at TJ Hunters: Tom Slattery (Carl) welcomes everyone.